It’s not enough for video game makers to hype new franchises and titles with a sleek ad campaign and a trailer, these days. They’re running huge events–like BlizzCon, which kicked off Friday–sometimes at a loss, to keep fans engaged. Does it work, and how well? Video game publishers used to spend hundreds of thousands of dollars per-title to get gamers’ attention with flashy trailers and ad campaigns. Today, they’re spending millions of dollars–sometimes at a loss–to throw massive events which are meant to bring gamers in their fan base a non-virtual place to convene, and maybe to bring newcomers into the fray. Is that really necessary? 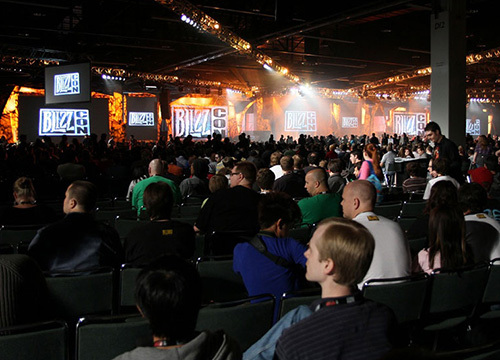 One such event is BlizzCon 2011, which started Friday. 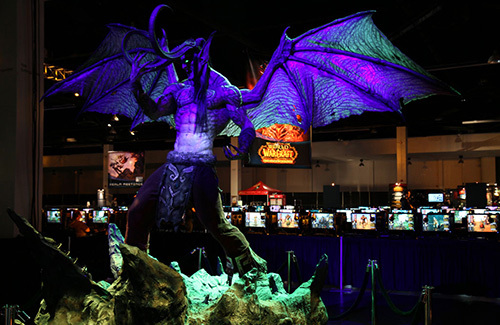 For those of us who aren’t among the 11.1 million-World of Warcraft (WoW) subscribers, or BlizzCon attendees, this is Blizzard Entertainment’s annual conference in Anaheim, California where they announce new WoW expansions, or reveal new games like StarCraft 2: Heart of the Swarm or Diablo 3. The company loses money on the event, but Paul Sams, COO of Blizzard says it’s worth it. Much like Blizzard, Activision implemented a digital feed of content from its “IRL” or in-real-life fan experience. “It wasn’t just an [event] for the 8,500 people who were there physically. Millions of people followed along online. We engaged millions of fans to give us their attention in a way that no traditional form of advertising could’ve delivered. The LiveStream video of the keynote presentation was the 2nd most viewed livestream ever,” said Hirschberg. This was long-form content; not 30-second spot advertising. Activision decided to take the revenue it made from the sales of $150 event tickets, and give it to a charity, the Call of Duty Endowment, that proivdes financial support to American troops and their families. With Call of Duty revenue exceeding $1 Billion per year, this good will only made sense. Huge fan weekends are few, though. Much more common in the games industry are launch events on a smaller (but not too small) scale. Companies orchestrate midnight sales extravaganzas, with thousands of stores opening in the wee hours in order to allow players an opportunity to buy or play a new game from their favorite series, first. Typically, a games retailer partners with a publisher to have a special event at a flagship store. 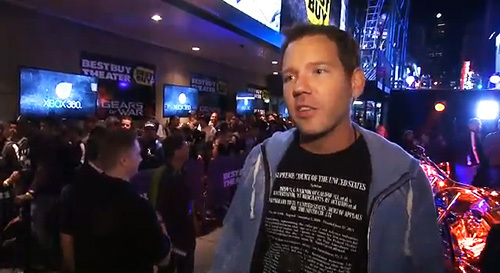 In September, Microsoft had its Gears of War 3 launch event at the Best Buy Theater in New York’s Times Square. “Best Buy wants to give people more when it comes to gaming and entertainment, and what better way than to open our doors early so our customers can be among the first to play Gears of War 3,” said Stacy Anderson, Best Buy’s Senior Director of Entertainment Marketing. 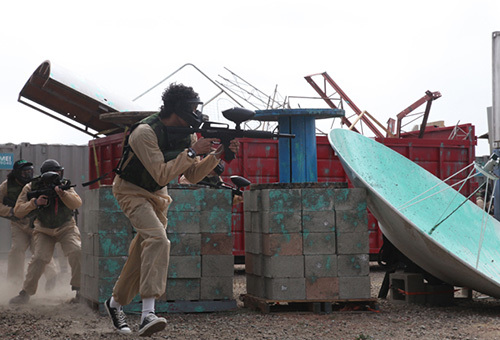 Gamers’ events have other excessive commonalities. Many feature music acts: Kanye at Call of Duty XP, Big Sean at the Gears event, and Foo Fighters are playing at BlizzCon tomorrow. They also dole out swag to non-competitors, and non-raffle-ticket holders. 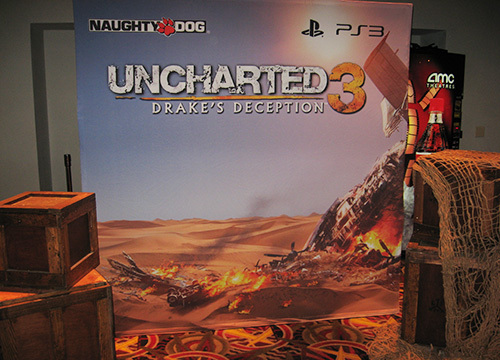 The freebies might be special downloads–BlizzCon distributed special virtual pets for WoW characters, and at Uncharted there was a code for unique clothing for avatars or characters to wear in Uncharted 3‘s multiplayer game. Naughty Dog’s co-president Evan Wells explained, “We are putting [events] on primarily for fans, and for them to get a chance to play the game early, or get the game early.” Attendees at the Uncharted event who paid $60 per premium ticket were able to sign up to get a physical copy of the game shipped to them a week before it would become available to the general public. In the world of gamers, the game creators are celebrities, like auteurs to film students, or the Jonas Bros. to teenage girls. I had the privilege to interview the game creator Cliff Bleszinski at the Gears of War 3 event, and was interrupted by excited fans with their own questions. What is the real return on investment for game companies holding these big events? Blizzard’s Sams said, “It’s a way of us to showcase and sometime even announce new content and new products. From our perspective, there is no better group to reward with the first look, first words on things that we are doing.” More quantitative results for BlizzCon included 26,000 tickets that sold out only seconds after they went on sale. The ROI will also be the social media and news coverage brands receive around an event. If the benefits of these tournaments, conferences and other events are not reflected in the sales of the games, why do companies continue to push extravagant gaming events each year? Blezinski also believes, “This is what it takes to launch a AAA game in 2011. Otherwise, you are just going to be a blip on the radar and no one is going to know you came out.” Keighley agrees. “It is not enough to be highly-rated. You have to go to that next level and try to become this pop culture phenomenon,” he said.